Ghana’s health system has undergone major trans-formational changes during the early 2000s, which resulted amongst other in the introduction of the national health insurance scheme in 2003. These reforms have brought numerous challenges for the health system, including challenges to assure the quality of care, improving capacity of providers, developing efficient payment mechanisms, prioritizing resources to the poor, and improving information systems. To address these challenges, stakeholders need sufficient capacity in health systems research and management but capacity is currently limited in Ghana. To establish a Master’s programme in health systems research and management at KNUST. To establish two network of researchers, students, alumni, and policy-makers. To establish a network of researchers working in similar areas at KNUST and at TU Berlin. To strengthen capacity of researchers at TU Berlin to engage in development cooperation. The project consists of a mix of activities, which will be carried out between January 2017 and December 2020. Most importantly, this includes a series of (1) workshops, (2) short courses, (3) teaching on the new Master’s programme, (4) project work, and (5) KNUST staff consultations. 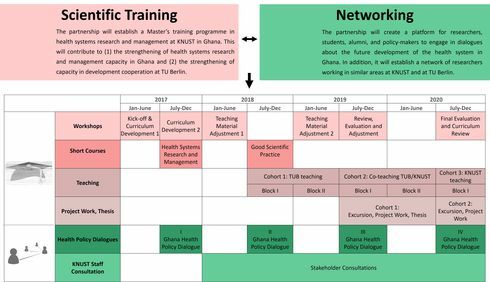 Workshops: The new master’s programme will be developed during several workshops, held in Germany and Ghana. The curriculum will draw on existing course modules taught at TU Berlin and at KNUST. Teaching material adjustments workshops will allow to tailor the courses to the needs of students in Ghana. 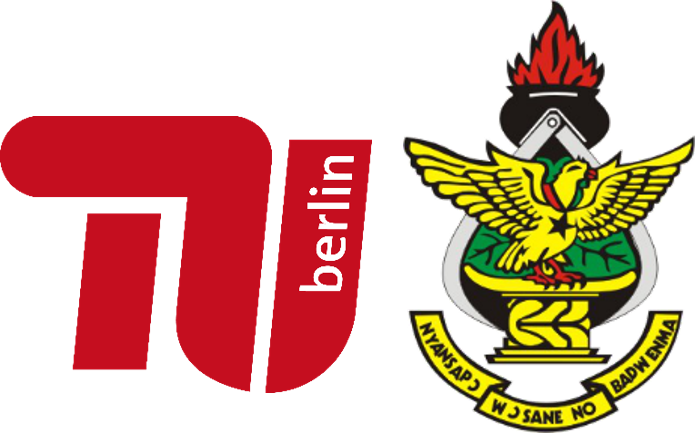 Teaching on the Master's programme: TU Berlin will contribute at least four modules to the new Master’s programme, which will initially be taught by TU Berlin staff in collaboration with KNUST staff. KNUST staff will progressively take over teaching of original TU Berlin modules. For further information on the Master's programme please follow this link. Project work: At least three students from each cohort will have the opportunity to do internships and research projects at TU Berlin. This will contribute to strengthening links of future researchers and policy-makers in Ghana with TU Berlin. Short Courses: One short course in Managing and Researching Health Systems taught at TU Berlin will be offered to KNUST staff and German MPH graduates intending to work in Africa. This will prepare KNUST staff for teaching and contribute to networking. KNUST staff will also participate in a TU Berlin seminar on Good Scientific Practice, which will contribute to improved capacity in the area. Health Policy Dialogues: Dialogues are organized annually in Ghana to establish strong links between students of the Master’s programme, alumni of German universities working in health system related fields in Ghana, researchers and policy-makers – including mainly the Ministry of Health, health services departments, hospitals and health facility managers, health practitioners and managers of health care programmes. KNUST Staff Consultations: With the support of TU Berlin, KNUST staff in Ghana will engage in year-round small-size stakeholder meetings. The purpose is to allow them to develop capacity in communicating effectively with policy-makers and to develop a strong network.